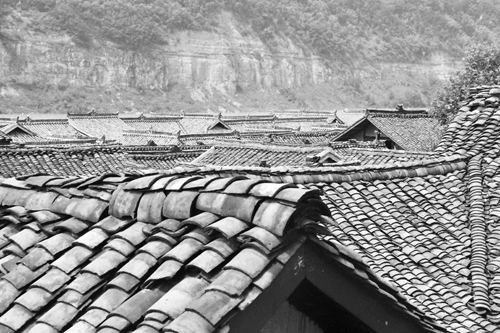 The mountain town of Songpan 松潘 has undergone a lot of changes in recent years but some original remnants of its wonderful ancient architecture still remain. Two of those structures are the emblematic ancient covered bridges (Gusong Qiao 古松桥 and Yingyue Qiao 映月桥) that span the fast flowing Min river 岷江。 Below are our photos taken before the recent development. 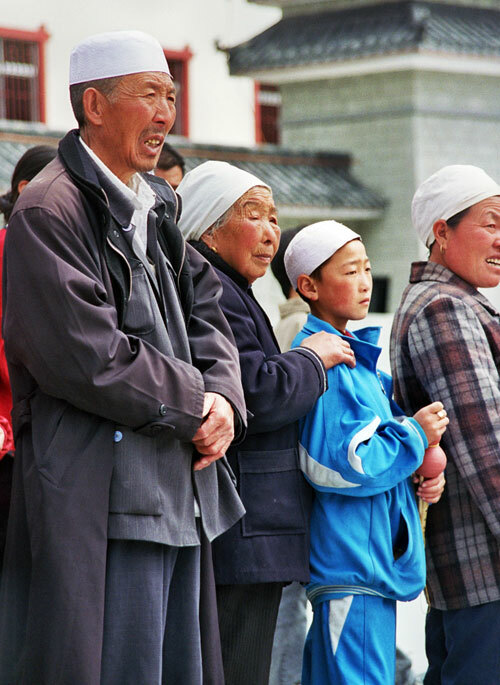 Songpan is an ethnically diverse town with Tibetans, Hui (Chinese Muslims) and Han Chinese all living together. It’s a great place to relax and has numerous tea houses along the river and next to the bridges. 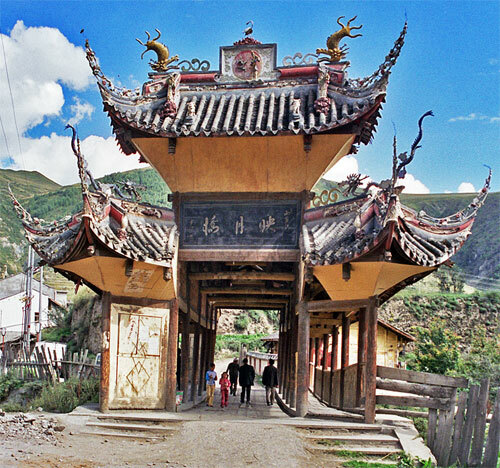 We’ve just received a travel update on the amazing teahouse village Luocheng 罗城镇 in Sichuan province. 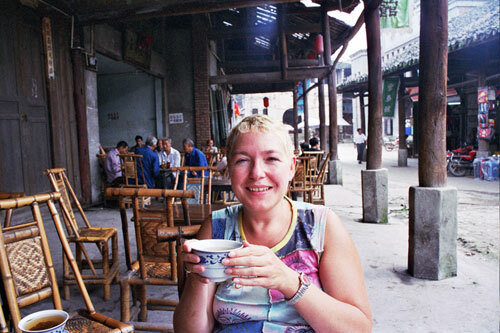 Many years ago we had a long and bumpy ride to Luocheng from Leshan. 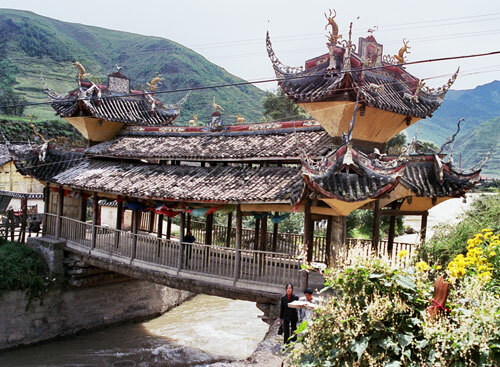 It now seems the trip can be done in around 3 ½ hours by bus directly from Chengdu along a good road. We’ve had a detailed comment from Wayne on our previous post. The bus timetables are below but click here to read the rest of the comment and more about Luocheng. Buses to Luocheng leave from Chengdu’s Shiyangchang Bus Station 石羊场汽车客运站 at 8.20 / 9.20 and 12.20 and return to Chengdu at 12.30/ 13.30 and 14.30. Tickets cost 67 Yuan. Bus number 28 goes to Shiyangchang Bus Station from downtown Chengdu. 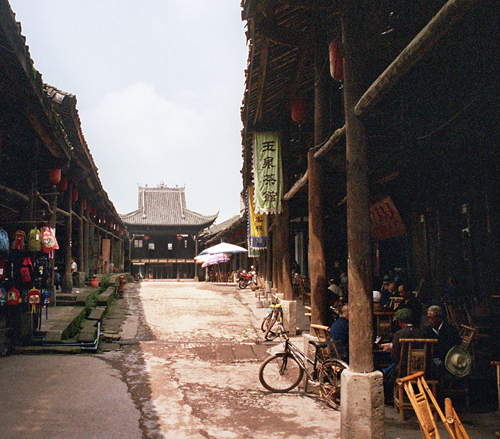 Luocheng: Is This The World’s Best Teahouse Town? 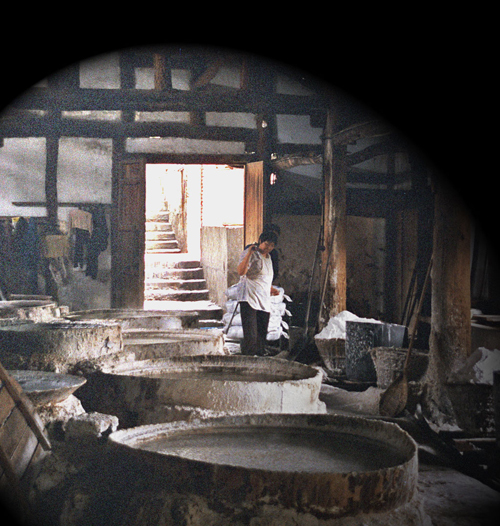 The ancient town of Luocheng is a gem for those looking for traditional teahouse culture. 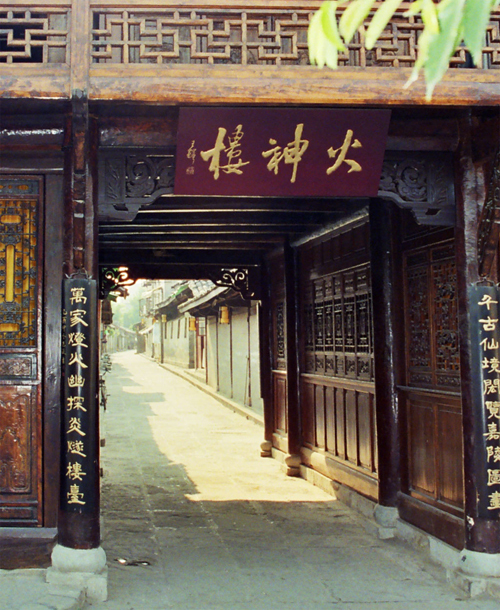 Luocheng is renowned for its boat architecture: the two sides of its main street narrow down at both ends and widen gradually towards the middle, thus creating the oval shape of a boat. Straddling the street and forming, as it were, the prow to complete the boat- like appearance of the town, stands a beautifully restored theatre. It is covered in traditional grey tiles and flamboyantly decorated with historic scenes and smiling Buddhas. 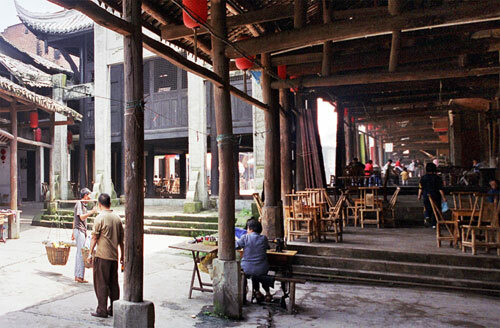 However, the absolute highlight of Luocheng is the swell of teahouses lining the main street, sheltered by the overhanging wooden porticos of the buildings. 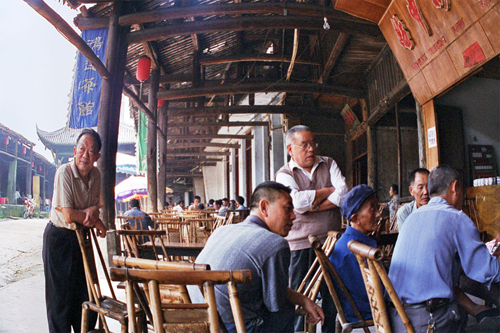 Overlooking this sea of bamboo tables and chairs, occupied by querulous old men in faded Mao jackets, arguing over heated games of cards or Mah-jong, while smoking small stubby pipes carved out of roots, visitors can truly imagine themselves in a time warp. 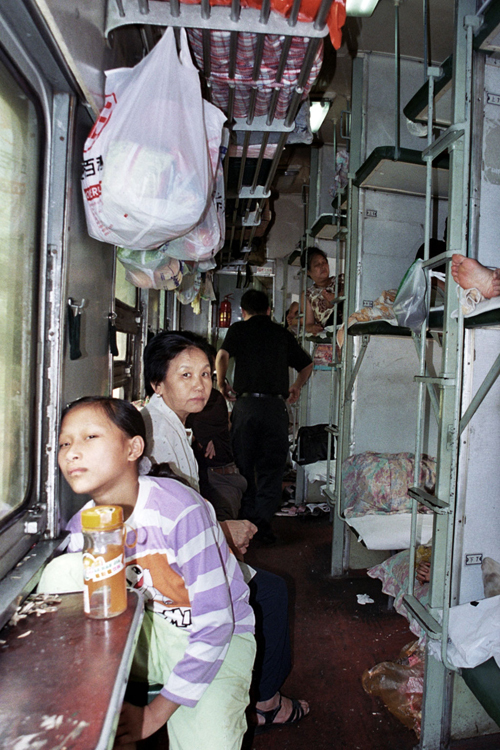 L trains operate only during the peak travel season, such as the Chinese Spring Festival and the National Holiday. These trains are not listed in the official fixed train schedule. It is not advised to take L-trains if you have other options as they are known to be relatively slow and regularly subject to delays”. “46 hours”. I doubted my Chinese at that moment, but the ticket seller repeated the departure and arrival times, there was no mistake. 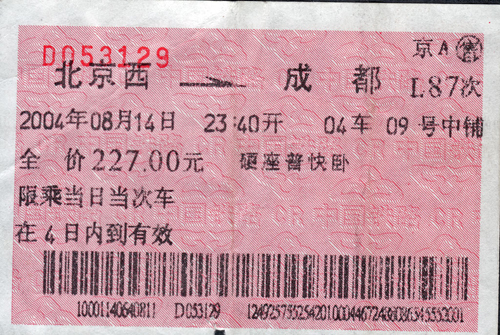 Bagging next day hard sleeper tickets from Beijing to Chengdu can be a taxing experience at the best of times, but in early August, you’ve got about as much chance as winning the lottery. 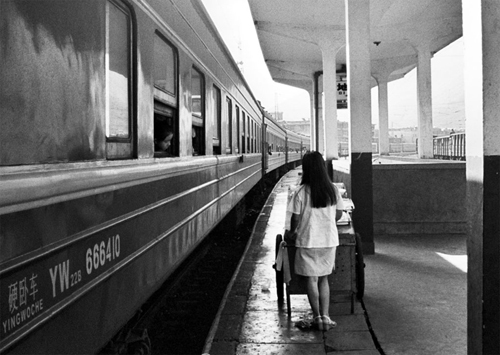 Unless … unless, of course, you are willing to take the slow train 临客 , or L Train as it is known in China! We got two middle berths, which are the best, as during the day you can escape the crowded lower berths, where everyone sits, and they have more space than the often claustrophobic upper berths. Pandemonium broke out when the gates were opened at Beijing West Station 北京西站 to allow the passengers on. Those without reservation ran frantically, pushing and shoving the old and weak out of the way, to grab one of those precious seats. It was a simple case of survival of the fittest; get a seat or stand for 46 hours. 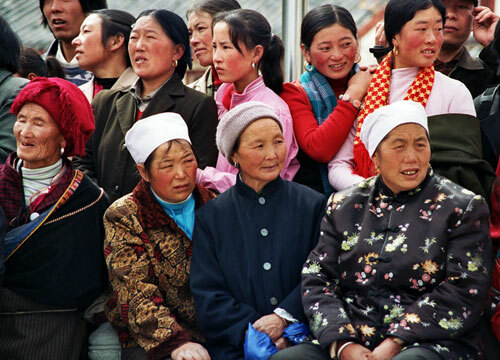 Last week’s Photo of the Week showed enthralled spectators enjoying the entertainment at the 2004 summer festival in Songpan, Sichuan Province. What was captivating them? 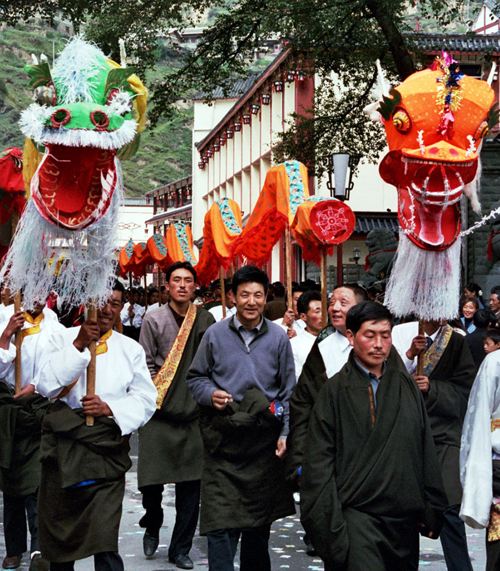 They were spellbound by a riot of colour as Chinese dragons, Tibetan Qiang minority dancers, and Muslim Hui singers took over the town, paraded through the streets and usurped the public squares. The real fun began after the Communist Party leaders had made their speeches, sped off to lunch in their limousines and left everyone to an afternoon of spontaneous revelry. Here are some photos of what they were enjoying. The walled town of Songpan, the gateway to the scenic heaven of Jiuzhaigou 九寨沟 and wild horse treks to Ice Mountain雪玉顶, is also a destination in itself. It`s a pleasant town with plenty of old architecture, local life and some fantastic tea houses. 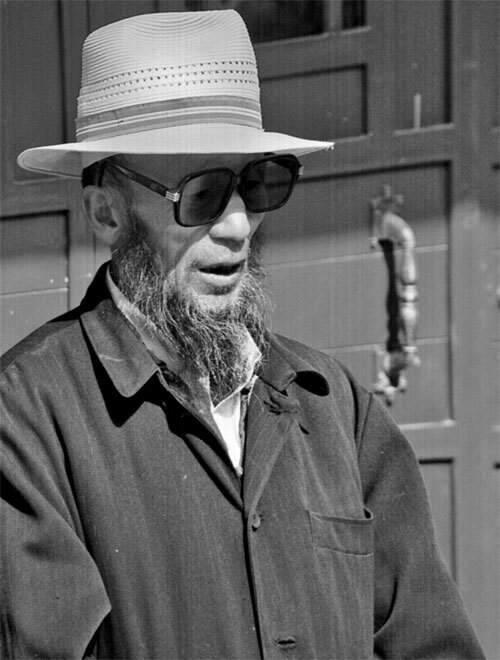 When we passed through in 2004 we were lucky enough to stumble upon a huge festival where the local Muslim Hui and Tibetan Qiang minorities were celebrating their local culture and dressed in their finest clothes. Joining them were a host of Chinese Communist Party Bigwigs, including the then vice-president, Zeng Qinghong. The residents of the entire town and surrounding villages turned out to see the festival. This small group of photos captures them enjoying the moment. Next week’s Photo of the Week will show what they were watching. This is our first holachina slideshow video. 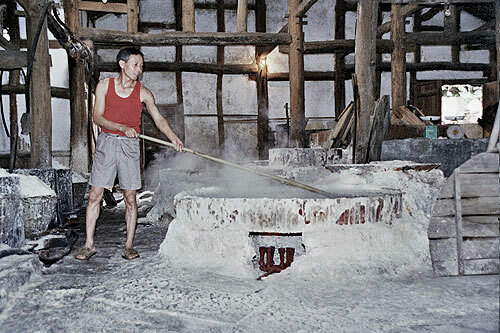 The photos were taken during the preparations for the Danba 丹巴Festival August 2004. 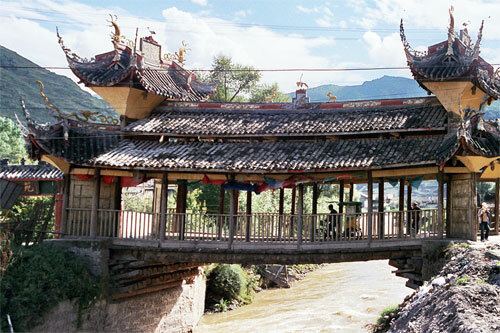 Danba is a small town in Western Sichuan about a 3 hour Bus ride from Kanding 康定. The town itself is small and scruffy but its setting, nestled in a deep valley at the confluence of two rushing rivers and surrounded by traditional Qiang (a Tibetan minority) villages, makes it quite idyllic. The highlights include stunning villages, such as Jiaju 甲居藏寨 and Badi (not Baidi as I have written in the video) and the Qiang watchtowers peppered on the slopes of the steep valleys. The year we visited Danba there were very few other foreigners and no domestic tourists. 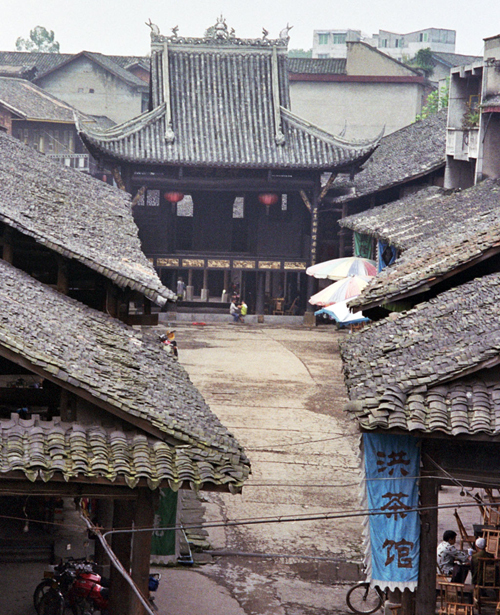 The following year, 2005, the Chinese National Geographic claimed that Jiaju village 甲居藏寨 (7kms from Danba) was the most beautiful village in China. Since then its popularity among travelers, foreign and Chinese alike, has grown rapidly. We hope you enjoy the slideshow. Some people may find the music a bit painful. It’s the same music that was being played on the VCD’s on all the buses we sat on during our trip around Western Sichuan in 2004 and it brings back great memories. 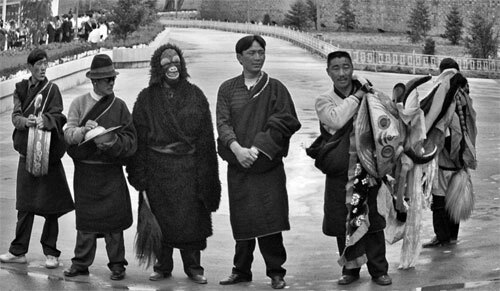 Here is a Tibetan song from the Qiang minority in Danba. This beautiful area is in Sichuan Province. The photo was taken in 2004 during rehearsals for the Danba festival. As you approach Zigong, sculptures and posters of dinosaurs announce that you’re arriving in “Dinosaur City”, as the city is known by the Chinese. 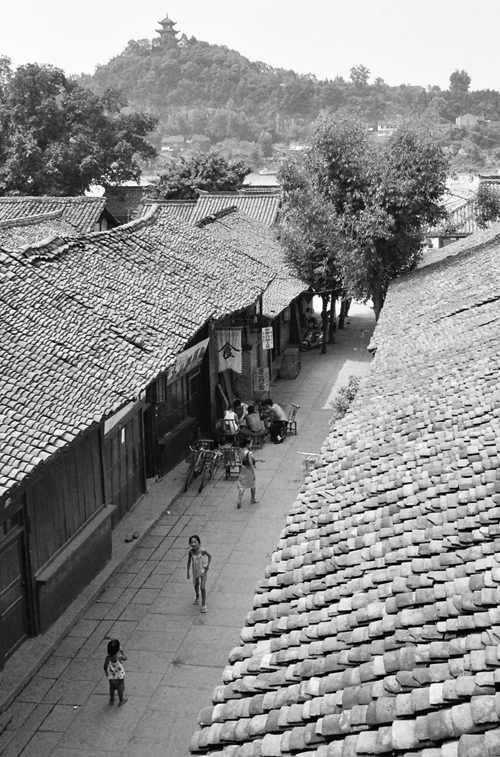 Zigong is a pleasant modern city, built along the banks of the Fuxi River that has so far managed to maintain large areas of traditional and interesting architecture, despite its recent development and prosperity. Besides Dinosaurs, Zigong has an abundance of sites, and is definitely worth spending a couple of days. The city owes its prosperity not so much to dinosaurs, as to salt and, in particular, the important role this product played during Imperial times.